Part 1 of 3 for a series of posts in the Writing 101 course. My son is pretty cute, so a lot of the requests he makes are pretty hard to turn down. And though I’ve mastered the art of steeling myself to say no to his requests to eat cookies for dinner and play outside in a blizzard, there is one request to which I try to always, always, say yes. I note with pride here that this was actually the first complete sentence this child spoke. He’s got two career educators for moms, and we know the value of reading to children from an early age. My son’s home library could stock a small children’s bookstore, and he’s been getting read-alouds from both of us since the day we brought him home from the hospital. For this three-part series, I thought I would focus on reading aloud with children, which is something that I do think gets lost today. TV and iPads have made it far too easy to neglect the important act of reading with your child, and as teacher I see the effects of this in the classroom and in the school library every day. Don’t get me wrong, my son gets his share of screen time–carefully selected apps and shows, and always monitored by us closely. But we always make time to read with him–especially when he ask for it on his own. 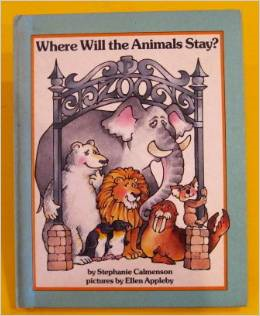 Today’s post, part one of this series on the lost practice of reading to kids, will focus on something that brings me a special kind of joy in reading aloud with my son, and that’s sharing with him books that I loved as a child. During a visit to my parents when I was pregnant, I had a great time raiding my childhood bookshelves, reliving the memories and anticipating sharing them with my soon-to-be-born baby. I’m happy to say that the following books I loved as a child now rank among my toddler’s most-requested books, as well. Although my wife teases me about my love for this “weird” book, I’m proud to have passed my fondness for it on to our son. Admittedly, it’s pretty dated, and a bit scattered and random, but the illustrations are truly lovely. Also, I think the slightly helter-skelter feel of it really reflects what a typical day might seem like through toddler eyes. 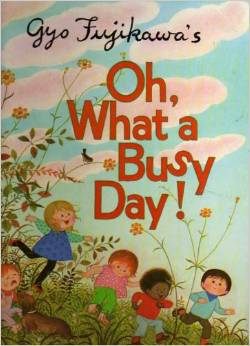 I loved this book as a little girl, and I take a lot of joy in reading my original copy with my son. What are your favorite books from childhood? Have you shared any of them with your kids? I enjoyed reading your post. Made me want to grab one of my favorite children’s books and read it. Think I can get my teens to sit and listen? What a great read. A great insight into your life. I’m so glad that you included the pictures of the books as I think children’s storybooks always have the most humorous covers. Cute post. I appreciate your reflections on reading out loud, and I agree with you that it seems this has been lost on these new generations. My parents read to us when we were kids. I especially remember when my dad read Huckleberry Finn to us every night; that was one of his favorites when he was a kid. Now my sister reads to my niece and she really loves it. So much so that she has some books memorized and when they finish one she always wants to read it over again. I think I got her 3-5 books for Christmas alone. 🙂 I’m that aunt. 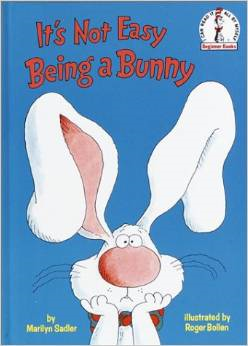 That said, It Ain’t Easy Being a Bunny was one I really liked as a kid as well as many other Dr. Seuss books. Honestly I had all but forgotten about it until now. 🙂 I loved the Serendipity series and just about any book with animals in it. Goodnight Moon was another good one but especially If You Give a Mouse a Cookie, that’s an awesome story.